Nikah is sunnah Prophet Muhammad (peace be upon him). Muslim marriage is asocial contract between man and woman, the contract ( Nikah ) signed after mutual agreement. Mahr is necessary part of this agreement that is given to bride from groom, it can be paid in cash form or in a gift or in property. Mahr may be handover to bride as soon as possible at wedding time. Nikah held in a ceremony in which family members participate and marriage sermon (khutba-t-nikah) recite by Molana sahib and after this contract is signed by bride, groom and their witnesses. 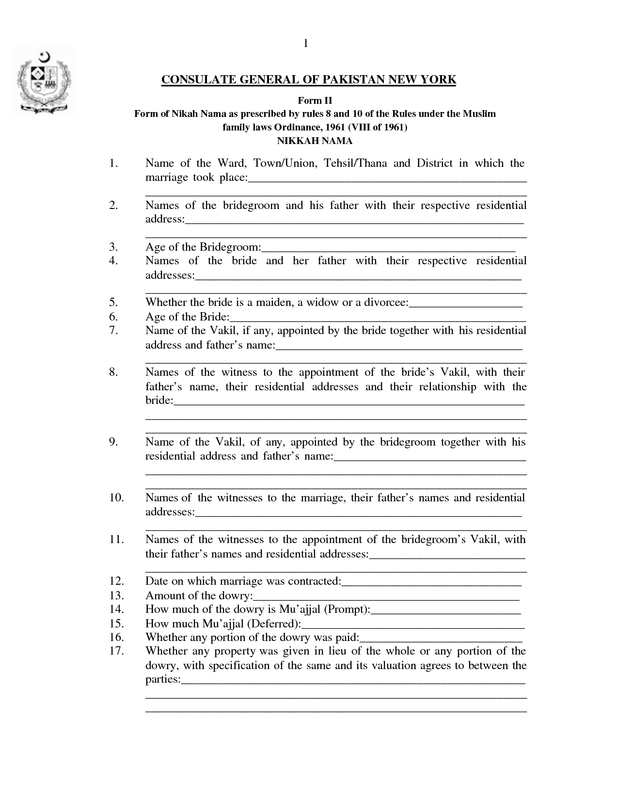 This contract paper is known as Nikah nama, in Pakistan it is in Urdu language, but in part of the world this Nikah nama is available in English or it can be translated in English or other western lanuages. Nikah nama is available in English version too, here is a spacemen of an Engllish Nikah nama.